Amalie Elixir Full Synthetic Motor Oils are the 21st Century oils for tough 21st Century work - protecting your engine Better Than It Has to Be! These oils offer the ultimate in engine protection for both gasoline and diesel engines - even those that are turbo-charged or super-charged. Formulated with state-of-the-art additives and 100% synthetic base stocks, Amalie Elixir Full- Synthetic Motor Oil has been carefully developed to meet the most current API Service Classification. Amalie Elixir Full Synthetic Motor Oil is formulated to meet or exceed all new car manufacturers' warranty requirements as well as stringent industry standards such as API SN/CF, ILSAC GF-5 and meets most European ACEA specifications. 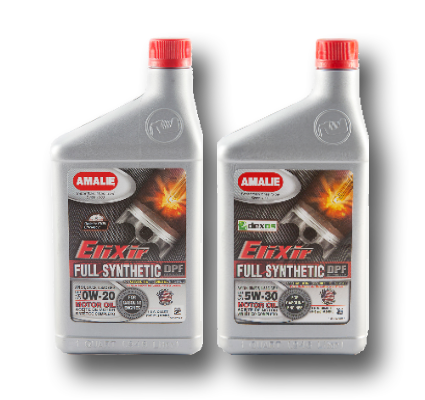 Amalie Elixir Full Synthetic 5W-30 dexos1® is specifically engineered and licensed to meet the stringent GM dexos1® engine oil specification. 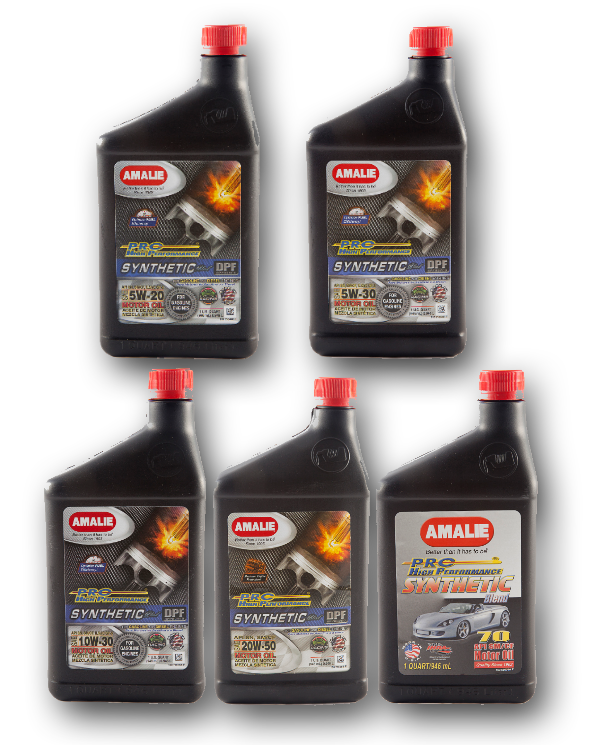 Amalie PRO High Performance Synthetic Blend Motor Oils are formulated with new and more robust engine oil chemistry combined with an optimum level of high quality synthetic and first quality mineral base stocks to provide outstanding engine protection for severe driving situations. These high performance motor oils are engineered and formulated to meet API SN/CF - ILSAC GF-5 and meets most European ACEA specifications. These high performance motor oils exceed the stringent lubricating performance requirements of American, European, Korean, Japanese and other worldwide engine manufacturers. Week in and week out Amalie PRO High Performance Synthetic Blend Motor Oils withstand the brutal pounding of professional top fuel racing. 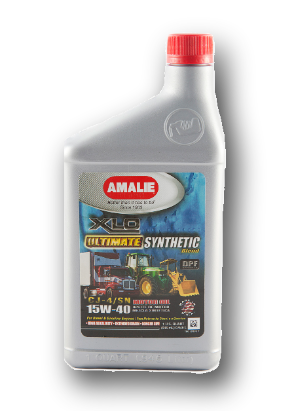 Amalie XLO Ultimate Synthetic-Blend 15W40 Motor Oil is a new high performance diesel engine oil developed to offer the ultimate in diesel engine oil protection for your new and expensive equipment by offering a better and stronger armor against wear, improved performance and greater fuel economy. These oils are especially equipped to protect EGR/Low-Emission Diesel Engines while maximizing the durability of Diesel Particulate Filters (DPF’s). New additive systems and rigorous laboratory and field testing have proven that these new oils are up to the task of protecting your engine; helping your engine operate within the new emission and pollution requirements as well as meeting or exceeding the OEM requirements for every new engine being built by every engine manufacturer worldwide, including but not limited to: Caterpillar, Cummins, DaimlerChrysler (Mercedes Benz), Detroit Diesel, Volvo, Mack (including the new and more stringent Mack EO-O Premium Plus 2007), MAN, and Navistar. These new oils meet or exceed the new API CJ-4/SN Service Classification and meet prior API specifications for CI-4 Plus, CI-4, CH-4, CG-4, CF-4, CF-2, CF and API SL, SJ, and SH. These oils are registered Mack EO-O Premium Plus '07, and meet prior specifications for EO-N Premium Plus, EO-M Plus, and EO-M.
Amalie X-treme 4T Motorcycle Oils are designed to provide wear protection, sludge and varnish protection, and thermal stability for superior performance in fourcycle motorcycle applications. 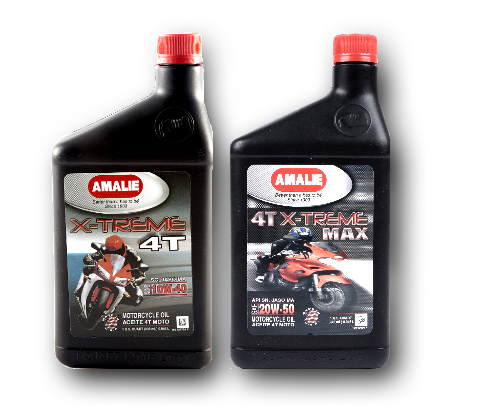 Blended with high-quality base stocks and performance chemistry, the Amalie 4T oils are formulated for superior operation in high-reving, high-temperature motorcycle engines and is blended to give superior performance in those engines and transmissions that have a common sump and require specialized frictional characteristics for clutches and wet brakes. Amalie X-treme 4T SG is available in SAE 10W40 and meets or exceeds API SG and JASO MA. Amalie 4-T X-treme Max MC is available in SAE 20W50 and meets or exceeds API SN and Jaso MA. 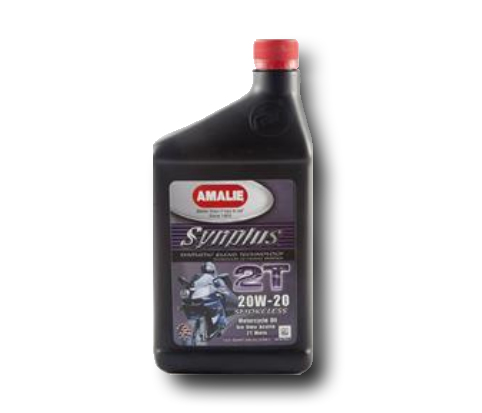 Amalie Synplus Synthetic Blend 2T Motorcycle Oil is a synthetic blend lubricant formulated for high performance air-cooled 2-cycle motorcycles and smaller four-cycle engines. It is truly a hightemperature oxidation resistant oil which protects against corrosion, ensures cleanliness, and provides lubricity for long engine life. This is a low ash formulation that prevents carbon deposit buildup on engine parts, and protects against ring sticking. This oil is formulated with high-temperature performance chemistry and special smoke reducing components to give you the ultimate in engine protection and environmental performance. These oils may be used in other air-cooled applications, such as snowmobiles, lawn mowers, string trimmers, air-blowers, snow blowers, all-terrain vehicles and many others requiring API service category TC, ISO-L-EGC, EGD and JASO FC, FD. 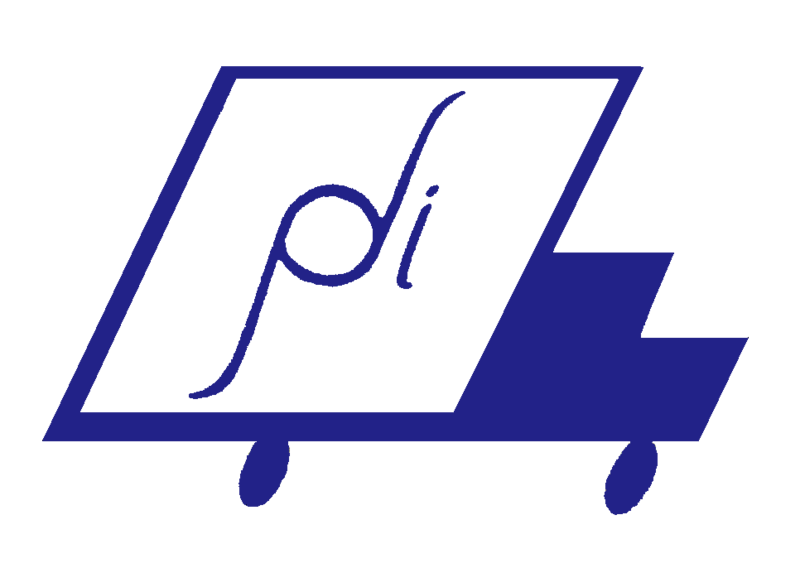 To see our Amalie Transmission Fluids, visit Amalie Transmission Fluids.